Persistence Market Research analyzes the global pest control products and services market between 2017 and 2026 in a new research publication. The primary objective of the report is to offer insights on the advancements in the global pest control products and services market. The study demonstrates market dynamics that are expected to influence the current environment and future status of the global pest control products and services market over the forecast period. The report also provides updates on key trends, drivers, restraints, value forecasts, and opportunities for manufacturers operating in the global pest control products and services market. The global pest control products and services market report is categorically divided into five sections based on market segmentation – by product type, by application type, by service type, by end user, and by region. The report begins with an overview of the global pest control products and services market followed by an in-depth analysis of the drivers, restraints, and trends influencing the global pest control products and services market. The subsequent sections analyze the global pest control products and services market on the basis of product type, application type, service type, end user, and region and evaluate the market basis the various factors impacting the global pest control products and services market, covering both the present scenario and future prospects. This comprehensive study discusses key regional trends contributing to the growth of the global pest control products and services market and analyzes the degree to which drivers are influencing the market in the five key regions of North America, Latin America, Europe, Asia Pacific, and the Middle East & Africa. The final section of the global pest control products and services market report presents a competitive market landscape to provide report audiences with a dashboard view of leading market players operating in the global pest control products and services market, along with their market performance, SWOT analysis, and key business strategies. The report further discusses how the overall competition in the market is steadily increasing and discusses various factors that are shaping internal as well as external competition in the market. Internal competition in the global pest control products and services market is comparatively high. Various barriers for new entrants are analyzed and rated on the basis of their impact on the competition levels in the market. The global pest control products and services market report utilizes extensive primary and secondary research to ascertain overall market size, top industry players, top products, industry associations, etc. The report incorporates various viewpoints based on secondary research. Furthermore, data points such as regional split and market split by product type, application type, service type, end user, and region; and qualitative inputs from industry experts have been taken into consideration to arrive at suitable market estimates. The report begins by sizing up the current market, which forms the basis for forecasting how the market is anticipated to take shape during the forecast period. Given the ever-fluctuating nature of the global economy, the report presents forecasts not only in terms of CAGR, but also analyzes the global pest control products and services market on the basis of key parameters such as Year-on-Year (Y-o-Y) growth to understand market predictability and to identify the right opportunities in the global pest control products and services market. Another key feature of this report is the analysis of all key segments in terms of absolute dollar opportunity, critical in assessing the level of opportunity that a provider can look to achieve, as well as to identify potential resources from a sales and delivery perspective in the global pest control products and services market. Further, to understand key growth segments in terms of growth and performance in the global pest control products and services market, Persistence Market Research has also developed a market attractiveness index to help providers identify real market opportunities in the global pest control products and services market. Due to an ever increasing urban population all around the world, there is an increase in food sources and conducive living habitats for different kinds of pests like rodents, cockroaches and mosquitoes. Due to this, there is a strong demand for pest control products and services all over the world. In addition, rapid migration is being witnessed from the rural areas to urban centers and this is more prevalent in developing countries. This further increases the population density of urban areas and thereby is expected to boost the demand for pest control products and services during the period of assessment. Consumers all over the world, especially from residential and commercial sectors are increasingly becoming more conscious about their health and are doing everything they can in order to maintain good health and hygiene. Due to this, there is a rise in adoption of pest control products and services in such sectors. Also, there is a rise in the types of diseases caused by different kind of pests and hence it becomes necessary to control them. There are rising concerns regarding the levels of toxicity in pesticides and the resultant health issues that arise due to the over use of toxic pesticides and this is restraining the growth of pest control products and services to a certain extent. Consumers, especially in the agricultural sector and food industry, are focused towards opting for pesticides with low toxic levels, owing to their associated adverse effects on health. According to ANVISA, a national health surveillance agency based in Brazil, in 2008, 64% of sweet-pepper produced in the country contained chemical residues above the prescribed limits allowed by the agency. To prevent such incidences, minimal use of pesticides is entailed, and this is likely to hinder the global pest control products and services market. Companies providing pest control solution and services are focusing on using bio-base pesticides instead of the toxic chemical pesticides so that they can claim to offer eco-friendly pest control products and services. This also helps such type of companies to adhere to strict government regulations. Adoption of organic pesticides for pest control is increasing at a significant rate, especially in developed regions such as Western Europe and North America. This is likely to give a boost to the global pest control products and services markets as it alleviates the concerns that consumers have regarding the toxicity levels in pesticides and health issues related to use of such toxic pesticides. Industries, especially food and beverages, adopt their own set of pest control measures, based on various factors such as raw materials used, production temperature and environment. This is encouraging pest control service providers to focus on various pest control programs designed to cater to varying demands of food companies. These include maintaining optimal levels of hygiene with hampering food products and keeping pests in-check. Pest control audits that comply with the HACCP, BRC, AIB and FEMAS requirements are also offered by these companies. 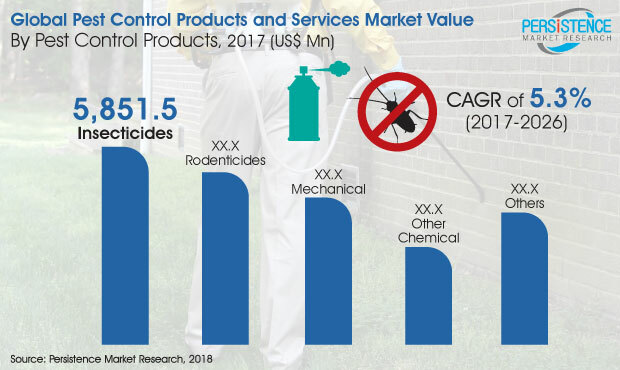 The insecticides segment in the global pest control products and services market was valued at US$ 5,851.5 Mn in 2017 and is forecasted to reach a valuation of US$ 9,619.2 Mn in 2026 end, reflecting a robust CAGR growth during the period of assessment 2017-2026. The mechanical segment was valued at US$ 3,548.8 Mn in 2017 and is anticipated to reach a valuation of US$ 5,635.6 Mn in 2026. Other segment is expected to be valued at US$ 4,325.6 Mn by 2026, displaying a moderate CAGR over the forecast period.